The Buzludzha (Buzludja) Monument is an abandoned building on top of a hill in the Central Stara Planina, Bulgaria. It was built in 1981 by the Bulgarian Communist Party to commemorate the creation of its fore-runner, the Bulgarian Social Democratic Party, but has been left unmaintained ever since communism fell in Bulgaria in 1989. Today, the Buzludzha Monument finds itself in a desolate condition and the entrance has been sealed with iron doors and bars – however, visitors still can enter the complex at their own risk. So why did I go to Buzludzha (Buzludja)? Well, I’m going to be very honest here: my travel motivation for Buzludzha (Buzludja) wasn’t its history, but primarily its architecture, the challenge of getting into a closed monument, the overall Bulgarian region and most importantly, the frailness of this massive ‘fortress’. 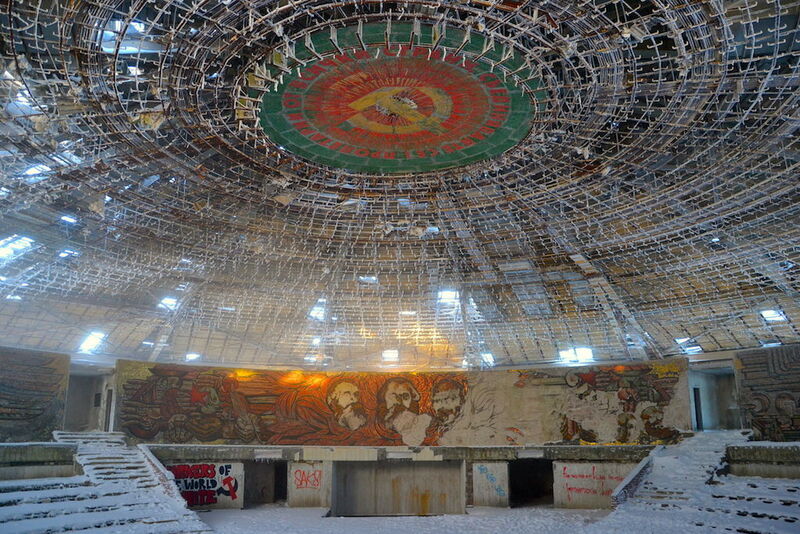 The strength and power that Buzludzha emanates is strongly contrasted by its fragile, devastated interior. The torn open roof, the crumbling mosaic art and the debris inside the building are clear indications of Buzludzha’s unstable condition. Due to the lack of urgently required funding for renovations, it is likely that the frail Buzludzha Auditorium will collapse sometime in the next decades. So if you want to visit one of the most impressive legacies of the Bulgarian Socialist/Communist era, I recommend to plan your trip before they seal up the Buzludzha Monument for good. I can hardly recall the moment I first walked into the Buzludzha Auditorium as I was so pumped with excitement, adrenalin and awe. Friedrich, my co-traveler, and I repeatedly mumbled an uncontrolled mix of words like “watch your step …”, “oh my god …”, “awesome …”, “be quiet, man …” while not actually listening to each other, but rather shining into every corner with our flashlights – making sure that nobody (or nothing…) else was there. We walked carefully into the center of the Buzludzha Auditorium, right beneath the giant symbol with the hammer and the sickle, literally taking a photo with every step we made. Believe me, I’ve seen a couple of cool things so far, but hardly anything compares to Buzludzha’s Great Auditorium with Marx’s, Engels’ and Lenin’s faces glowing at us in the red morning sun. That’s when I knew that I found what I came for and I felt welcomed in Buzludzha (Buzludja). Our first photos and selfies in the Buzludzha Auditorium were still made with the clear glare of the morning sun, but within a few minutes, the fog from the outside creeped up on us and quickly occupied the entire building. The wind increased and we repeatedly looked at the ceiling, which filled the entire room with life. The creaking, shrieking, clacking and all other ‘-ings’ of the loose parts on the ceiling constantly reminded us to tread lightly and to keep our voice low – who knows what our echo could unleash. I’m far from being a structural engineer, but I was very aware that the Buzludzha Monument has not been inspected for a while for its statics and the extra weight of snow on the roof wasn’t helping either. The reception of our mobile phones was alright, but if anything should have happened, it would have taken many hours until decent help could have arrived. Staying smart was definitely our top priority in Buzludzha (Buzludja). Did you enjoy our Buzludzha adventure so far? We took a few more photos of the deteriorating mosaic art on the walls and left the Buzludzha Auditorium to what you could describe as the ‘Outer Ring’. By that time, the fog got so intense, we could not even see ten meters far. We were staring into pure grey. It was a bit scary, since we realized that if we had had arrived an hour later, we would never have managed to find the Buzludzha Monument. Wandering in the deep snow would have been too exhausting for us to ‘scout’ the area by pure luck – and we couldn’t have seen it from the far. We felt a bit trapped, but at the same time also more safe – it was very unlikely that someone else would make its way through the heavy fog. And Buzludzha Monument is definitely one of those places where you aren’t too keen on bumping into a stranger. We passed through the Buzludzha Auditorium and walked all the way down the stairs to the ground floor. Unlike the light-filled top floor, the ground floor of the Buzludzha Monument is mostly protected from the wind and the sun – with all advantages and disadvantages. And yes, this is where the eerie part begins. You should bring a flashlight, otherwise you’ll miss all the trash, asbestos, debris and booze bottles lying around inside of Buzludzha. But if you want to reach the tower from the inside, I don’t think there is another way. You can either pass through the very very dark back room with plenty of holes in the ground to embark on your climb to the top of the Buzludzha Tower, or continue into the abandoned depths of Buzludzha. We did not climb up the tower, however, as we were fairly intimidated by the rundown corridors, pipes and walls. Plus, the fog didn’t promise us a great view, anyway. And most importantly: we generously left that part open to explore and document for others, like you! Thanks ahead for that. How to travel to Buzludzha Monument (Buzludja)? We arrived at Sofia Airport on a Friday afternoon and immediately rented our 4WD Land Rover. After a 240-kilometers drive to Kazanluk (nearest city to Buzludzha, approximately a 30-minute ride), we spent the night there and got up at 5.30 a.m. to drive up the Shipka Pass. In the summer, you can easily drive up almost all the way to the top of Buzludzha by taking a side road from the Shipka Pass (you will not pass by the town of Shipka). You will recognize the road to Buzludzha by a large statue, shortly after passing by Kran. During winter months, it is highly advised to have a 4WD and/or snow chains as the road is not maintained. On our way back we actually passed a car that had too little grip and got stuck, so either really do get a decent ride or hike it (approximately three hours, one way). Be prepared for cold weather and possibly impaired sight due to strong fog. You will be able to drive up the 12 km road until you can see the Buzludzha Monument. However, you’ll reach a point where the roads are covered with too much snow, so we parked our car and continued on foot. The snow was at least 40 cm high and it was fairly steep in some parts, so it cost us a decent amount of energy and about 20 minutes to reach Buzludzha Monument. 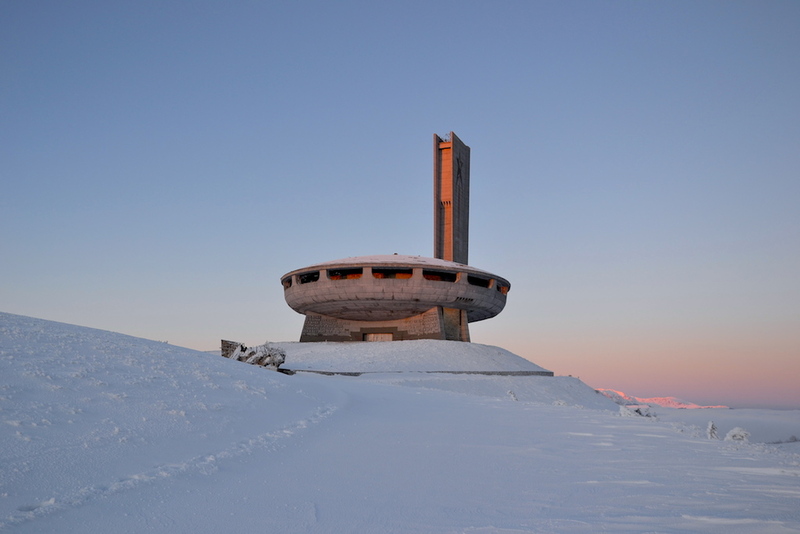 You should definitely be well prepared for Buzludzha, especially during the winter months. Flashlight – many parts on the inside of Buzludzha are dark. A flashlight is imperative, should you decide to access the underground levels or tower. Decent shoes – climbing into Buzludzha is fairly manageable. However, due to the high amount of debris and trash within the building, I recommend to wear boots or robust shoes. Gloves – if you decide to travel to Buzludzha in the winter months, I strongly recommend to wear snow gloves. You will most likely have to path your way through snow. Snacks and drinks – there is no possibility to buy anything in Buzludzha. For questions or feedback regarding the Buzludzha Monument, please feel free to leave a comment at the bottom of this page. Readers have informed me that the small opening on the right hand side of Buzludzha’s entrance has been sealed. Now all entries are firmly closed and there is currently no known way of entering the building. Cameras and speakers were installed on the premises. Thanks to Andrei B., Leo B. and Nicholas for sharing this update. We were there in 2012, around June/July. They must have welded the front doors closed, as we were able to get in by pulling the front gate open. From more than 12 months on the road, this is one of the top 5 highlights. We did climb up the ladders to the roof, the sun shines through the red star and fills the top with a glowing pinkish light. It’s quite intimidating though, as full of birds (which we thought were bats), it’s completely dark and by the time you climb to the top you are pretty exhausted. It is an intimidating enough place to be in, that just makes it more intense. Yeah, I can imagine how intimidating it had to be. As far as I know, someone actually “cleaned up” the site a bit, even inside (debris and stuff). I went February 2014, so it must have been even more abandoned in June/July 2012. You’re a true pioneer, Jackson! I was just there earlier today and the hole you described getting in through is still there. That is how we entered as the front gates were welded shut. We ventured everywhere, including into the wet, fly-laden basement that led to the ladders up the tower. We climbed the tower’s 320 rungs to get to the top. We went all the way to the roof. There was a thunderstorm brewing up there and our hair stood on end from the static electricity in the air. It was quite an exhausting but rewarding adventure. We went there a couple of weeks back. The hole in the side remains to get in. We also climbed the tower and got right outside on to the scaffold on the roof. Great advice above on what to bring. Walking boots were invaluable as well as head lamps. Also brought heavy ‘gardening’ gloves! It’s an astonishing place that is literally falling apart in front of your eyes. Kind of surreal seeing a large group of horses hanging about outside when we drove up to the site. Really not going to last forever, so get there if you can sooner than later. Thanks a lot for sharing this information on travelling here as I have been dreaming about seeing this place with my own eyes. Keep up the great travels. Thanks for the kind words, Elle! I can totally relate to your dream – I had it once, too! 🙂 Let me know if you need any more information about Buzludzha, I’ll gladly help you. Great website! I am planning to visit in mid November. Do you have any idea if there will be snow there during this time? Also, if you can share any maps with me, I would be very appreciative. Thanks, Matthew! I’m quite sure that there is no snow this time of year, as the temperature is still clearly above freezing point. 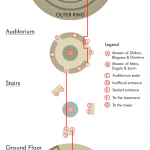 And you can find a map as PDF in my last section of this article “Recommended preparation for Buzludzha”. Great site with major further upside potential , I am glad to have found it !. My wife and I will be in Sofia for a few days late October and thought about renting a car and making a day trip to Buzludzha. the visitors from the posts I read usually stay in nearby cities like Kazanluk or Shipka and visit the site from there, but as we have a prepaid accomodation in Sofia for our whole stay, we would prefer to do the trip from the capital, if it s not too exhausting. Anybody who experienced visiting the site from Sofia and can also possibly furnish us with recommended schedule/directions is very much welcome. My other worry (snow) is I guess not an issue, at least based on Valentin’s last entry, which also leads my to believe that a normal economy class small car could suit our needs (?). Regarding your question: I also traveled from Sofia. You could theoretically do it in a single day, just leave very early. One way should take you roughly 4 hours, including 1-2 breaks for gas or food (I’d recommend the highway). Here’s the route I took on the way back: http://goo.gl/HYBneh Getting back from there is fairly easy, so I wouldn’t worry about driving back in the late hours. The highway is in good condition. At the end of October, I wouldn’t expect any heavy snow yet. So economy car should do fine. However, if it does snow heavily, you’ll probably have a hard time. When driving back with my 4WD, I did pass a car that had no more grip in the snow and got stuck. I would consider a short-term upgrade, in case of heavy snow. These are some really great photos and a great description of your exploration of the Buzludzha. I’m the founder of Sagacity Magazine, and we’ll be doing a feature on abandoned Soviet sites for our February, 2015 issue. If you’d be up for talking to us, please email me at brett@sagmag.com. You can check out Sagacity at sagmag.com. Thank you for an inspiring guide to visiting Buzludzha. I was there on October 12th, and my biggest surprise was that a lot of other people were there as well. Going on a Sunday in the middle of the day is maybe not the best time if you want the place to yourself. However, if you are a little worried about crawling into the monument, I can assure you that it seemed a totally common thing to do. Thanks, Magne! I checked your photos and was very surprised to find the floor in the great auditorium so clean! Someone seemed to put in some effort to somewhat maintain the building. And also, someone added a new slogan to the entrance. It used to say “Don’t Forget Your Past”, then it was completely removed and now it says “Never Forget Your Past”. Great article, and really good images. It looks amazing in the winter, and I like that you included the video of the auditorium covered in snow. Your visit sounds like a great adventure. Your site is excellent: great images and well written. I like the article on Lake Natron too. Thank you for your compliments, Kevin! I also enjoyed your take on Buzludzha and especially the one on Perito Moreno. Great photographs! I wouldn’t worry about it! It’s easily done alone in a day. Also, chances are, that you’ll meet other explorers there anyway. Buzludzha has gained a lot of attention in the last year, so go for it anyway! You won’t regret it. Hey Rita, great idea! The town of Shipka is very near and there shouldn’t be any snow at this time of year, so I’m sure you’ll have no difficulties finding a taxi. Everybody knows Buzludzha at Shipka! Enjoy your adventure! No snow in March? Definitely not great advice there. Not only is there most likely to be snow in most of Bulgaria at that time of year, but in the mountains it’s pretty much guaranteed. There can be snow in Shipka from November – April, and at Buzludzha from late October – May. I was at Buzludzha in late April and there was snow on the ground and inside the building. Thanks for correcting, Paul! I really appreciate the info! However, I would expect that there’s a lot less snow in April and therefore easier to access than from Dec to Feb.
What an impressive site! A fantastic read and stunning photographs! I have always wanted to visit and explore inside such a powerful place, and after this read I will be planning my trip there this year! I will also be exploring the rest of your amazing site. I’ve heard many stories about the drive from Sofia, can I ask, What was it like and roughly how long did it take? Im possibly planning a return same day trip ( in September ) depending on travel plans. Thanks in Advance! Thanks for the compliment, really thrilled to hear you like the site! Regarding the drive to Buzludzha: I drove to Kazanlak first from Sofia. You can either take the country road or the highway to get there. The highway is longer, but faster in total. Both roads are easy to drive and in good condition, so don’t worry about that at all. Considering the good conditions, the durations you get on Google Maps or so are very representative! Thank you for sharing all with us. This looks very interesting .Some belgian journalists also entered last year , 2014. Anyone an idea whether it is still possible to enter .I would like to go next week and have arranged a guide from sofia . After having discovered this amazing place lasy year, I’m finally decided to go there next winter for a photographic trip. According to you, what would be the best month to get a dramatic winter atmosphere (Snow/Fog…)? Thanks, and congrats for your amazing website. Hi Ben, congrats on your decision to visit Buzludzha! I went there in the beginning of February and it was in deep snow – fairly exhausting to reach, as you cannot drive up all the way and will have to fight through the snow all the way to the top. Regarding the fog: I arrived there at around 7 AM and it was clear, and only one hour later, you couldn’t see 5 meters into the distance. You’ll just have to try your luck! Do drop a link here, once you got to photograph Buzludzha! Bonne chance. Great publish, very informative. I’m wondering why the other experts of this sector don’t realize this. You must proceed your writing. I’m confident, you’ve a great readers’ base already! Do you think I can rent a car to there from air port even though I am Japanese and have international driver lisence. And how much did you cost to rent the car when you rented 4wd? Is there other ways to get there?? Hi Kasei, I’m sure you can rent a 4WD from the airport – I did. There are all international car rental companies, so you can easily check online how much it will cost you. And yes, there are other ways: you could probably take a bus to Kazanluk and find a taxi from there. However, it might be more difficult to find a taxi that can take you to the top if there is a lot of snow in the winter, so make sure to plan enough time to find a driver. がんばって! Thanks for this guide! I’m visiting Sofia in late March and am contemplating making a day trip out to Buzludzha. When it comes to making the drive, will snow be an issue at that time of year? Hi Ryan, in general, I would expect snow in March along the Shipka Pass, although less than in the winter. My best advice is to check the weather in the area and see if it has been snowing and cold, or rather warm already like in many European cities this summer. Hope it helps and enjoy the adventure! Hi Valentin, where did you stay in Kazanlak? Do you remember the name of the hostel/hotel? I’m planning on going this weekend. Also do you have any information on bus schedule from Sofia? Thanks! Hi Carmen, I stayed at Hotel Diamond as they had parking spots right across the street. It was a nice hotel. I unfortunately don’t know the bus schedule as I rented a 4WD for this trip. I wish you best of success and a great adventure this weekend! I’m doing Erasmus in Veliko Tarnovo with a friend and we are thinking about going there on friday. But there are some people saying that is completely locked and that we can’t enter there. We have been searching about it (actually it was how we found your post) but we still have some doubts. Maybe you are more inside the subject and can help us?? Hey Catarina, I don’t know about it being locked. The main gates were heavily sealed, but I find it hard to believe that they locked up the hole in the wall right of the entrance. I’d take the risk – it’s also impressive from the outside. Best of luck! First of all thank you for the article, using the info you provided it was really easy to find and access the place. The entrance from the right side is closed now. Some metal grill is installed. (I can send you pictures for more details). Luckily we found an opening in the main entrance (pictures if needed). The place is decaying fast. Parts of the roof are missing now if we are about to compare to your photos. Off topic: Please let me know if you have something planned or any interesting information that you are willing to share regarding Cambodja. May I have a copy of your photos (of both the grilled hole and the new opening you found)? Also, I plan to travel there in April. Is it easy to find a taxi outside the Kazanlak train station? How much does a round trip (train station-Buzludzha) normally cost? How long does it approximately take to complete the round trip (say I were to spend 1 hour inside Buzludzha)? I would appreciate the pics on where to get in now please as we are going in 3 weeks. Hi all, thanks for your comments, truly appreciate them! I’ve updated the post with new photos that Andrei generously shared with us. Take a look- and be more careful; Buzludzha today is apparently in a visibly worse condition than on my photos. How to get in in feburary 2017? I am planning to go there soon. Anyone an idea? Who got the keys? Any secret inside tours you can take? Another open whole? Thank you for all the info. I will be trying to stay in Kazanlak. I have no rental and looking for ways to go up to the building. Any suggestions? Walk the whole way? Taxi? Rent a car? Bus to shipka then walk? Hi Anthony, thanks for your comment. Of course, you could walk from Shipka or Kazanlak, but I think it’s too far. Best way would definitely to take a taxi (especially is in the months without snow) or rent a car, if preferred. Hope you enjoy your visit! Since the last update from (7.05.16), the front (gated) entrance has been locked again by the authorities, it looks as it they have used some heavy duty steel bars to lock the gates together and prevent any kind of access. The side entrance remains covered with the metal grill again preventing access via this route aswell. I can confirm from my visit that a third entrance is now available which allowed me to get inside Buzludzha. The new entrance is on the right hand side of the building, past the side entrance and towards the tower. You will notice (at groundlevel) that someone has pulled away one of the metal pieces for an old airduct revealing a new access point into the building. The entrance was very small, had some sharp metal edges and you will have to crawl through it carefully. However, after passing though this, you will enter a small side room. To exit the side room, you have to pass through another hole which leads to the corridor linking the main building to the tower. This hole was very high up but fortunately someone had placed some wooden beams inside so that you could climb up and pass through it relatively easily. Hi, I’m hoping to visit in a couple of weeks with a couple of friends… would be great to see your photos of the new entrance for reference. I’m not that fit either, is it easy enough to get in?! Hi Rich, I updated the post with two new photos of Buzludzha. As you can see, the difficulty of getting in has increased, as there’s a lot of climbing involved. Hope it helps and thanks again to Leo B. for the valuable update! Hello, was at Buzludha in july , enter is on right side of the objective, a little tight but not impossible like Leo B said, have a yellow grafitti “marking” bxod as entrance. Thanks for the clarification, Ionel – hope you had a fantastic trip! Hi everyone, thanks for sharing your adventure and updating it with useful info on how To get in. I will be travelling in Bulgaria by myself in August. I dont have à car I am thinking of getting to a nearby town by train or bus but not sure what would be the safest and smartest way to get to Buzludha. Is hostel mostel still guiding inside the monument ? Who should I ask for guiding and getting there ? *Is Hostel Mostel still guiding TO the monument ? Hey Alissa, getting to Buzludzha should be easily doable with a taxi from a nearby town. Regarding your questions about Hostel Mostel, you’ll have to ask them directly. Hope you have a great adventure! Just been and when we were there it was a Saturday. There was a film set there and also police. We managed to climb in the original entrance from this post but once in a very loud alarm went off. Unfortunately we freaked out as there were police outside so jumped back out. However, I doubt very much that they would follow you in and The alarm turned off after a minute or so. Quite gutted we didn’t see the inside but a cool place nonetheless! Update from 2016-07-29 : I’ve been here yesterday and unfortunately, the second entry is now also closed. I didn’t find any way to get in. They also add camera and speakers. The installations seems to be very recent. Damned! Why don’t they want us to explore the inside of this fantastic building ! This is a great recap. Thank you! I really really wanted to visit Buzludzha and was intending on doing so this October. Now that I heard from you that all entrances have been closed off, I am saddened and very angry to hear this. I love ruins and this was on my list for a couple of years now. If you or anyone could keep us informed of the status of the various entrances, I would seriously appreciate it. I have heard that the Bulgarian government has finally decided to renovate the place which is a shame in a sense because the mythical nature of it will be changed and it will not be a ruin anymore. Hi, I went on August 7th, no way to enter. There were cameras but we think they are fake. Informed at Shipka town that there had been recently (June) a meeting of the communist party ant this had lead to increase security and sealing all entrances. They think that in some months somebody will break in again. A good idea may be contacting through email any of the hotels at Shipka (they are used to receive Buzludha visitors) and kindly ask them to get the latest news. From my experience, it’s very frustrating to get there and stay out!, I still feel angry and impotent. The real thing, however, is that as time goes by, entering is becoming more and more dangerous, no wonder why they have sealed it. I just came across this site while browsing the web for more info and documentation on this amazing piece of history. Tim, did you see Jason Statham? It turns out they visited the site for filming some scenes in The Mechanic Resurrection! Hi all, any news about the entrances? Was there yesterday and unfortunately it’s completely sealed. I went there with a friend just a few days ago on same day than Penny (Hi Penny, did not see you though 🙂 Can confirm everything is sealed, motion sensors and security cams are installed on various spots. It really looks like the condition gets worse and worse and we had none of the equipment like torch etc anyhow so did also not search for hours to make our way inside. Also all tour operators told us that the building is unaccessible now (we went via a rather pricy car ride that was organized from Old Plovdiv Guesthouse, 2hour one way). Although I am slightly gutted about the “bad” timing and not having seen the inside, we still enjoyed it a lot. The weather was superb, we were alone! (apparently not for granted in the days it was still easy to access inside) and only the outside and the view all around on the mountains is spectacular enough. does anybody have information about the current situtation ?I am planning to visit it in 2 weeks. Is there any way to enter it? even if climbing, or ropes are involved. Did you finally go? Were you able to go inside? We are planning to go for New Year’s Eve, so wanted to know if there is still any chance to get inside. This is awesome news! How did you end up getting there? I am coming from Sofia and would love to check it out and go inside. Hi guys, I might continue this thread of ‘did you find the hole, did you get in?’ 🙂 …? I’m heading there on Friday/Saturday and would love to know before embarking on the journey. I will go anyway but it would be really great to know as much as possible so that I can be prepared. And thank you Valentin for putting together this post, it’s one of the most extensive accounts that I’ve found so far – and the photos are really great. Cheers for sharing! Hi, we were on February 22nd and everything perfect, the hole is still near the tower, the only problem is the height to the room to be lowered, although we have made some rope ladders and now it is easier to enter. You will have to climb on foot the last km due to the snow. Good trip. There are currently (from the morning of 20 March 2017) two holes at the back to get in. Thanks for leaving the rope tied to the wooden plank! The rope is no more there neither the ladder but it is still possible to enter. The door for the tower is blocked. There are few hostels in Plovdiv organizing trips to the place. I visited in June 17 – the holes in the ground are still accessible, but no ropes, so it feels a bit dangerous entering, but still possible! Recommend taking a rope/rope ladder with you if pos. Such an incredible place! Hello, my wife and I went to Buzludzha last month on the 13th and the 14th (of July 2017), the holes were still there and I was able to enter by climbing on a wooden plank across to the metal equipment racks in the basement. On our second day there was an entire tour group (hostel?) entering the monument – it seemed to be a popular place on the weekends. However my wife wasn’t able to enter due to the height of entrance and being worried about getting back out. So we prepared. I ordered a metal caving ladder that I intended to leave behind (for other explorers to use), and we made our way back with a couple other friends on the 27th of July. I tell you all of this to hopefully convey how disappointed we were when we arrived to find a security car and construction truck at the site. On our third visit to the monument, and the visit in which we brought friends and a ladder, was the day we arrived to find around 8 men wearing green ponchos filling the holes with rocks. We considered waiting and pulling the rocks back out, but there was no guarantee that they would be leaving any time soon. I can only assume that they are planning on coming back and pouring concrete on top of the rocks. We also noticed they had installed new security plaques and a new security camera, they may have hired a new security company. Many theories as to why this was happening now and how it was just our luck they were closing it off today were brought up on the three hour drive home. I went there the 17th of december this year. We went inside using a hole in the ground. I think the same you talked about on the left of the building. Not so safe but quit easy to go. Girls and a friend afraid of height made it. It was in winter so we couldn’t reach the top with the car (rent) so we continued by walking. We were in the cloud, frozen cloud, and the discovering of the building was one of the best moment in my life. The second best moment was the entrance of the big room. We tried to find a way to the tower but we couldn’t find a door, or stairs. I have an Iphone and Iphone + cold = battery down. No 3G at the top. I really want to go back there, but as I read all your messages, I feel a bit lucky to have enterred the building so futur will tell us if I will go back.